Might you want to know more about the Excalibur dehydrator with the timer? If yes, then continue reading the below article. 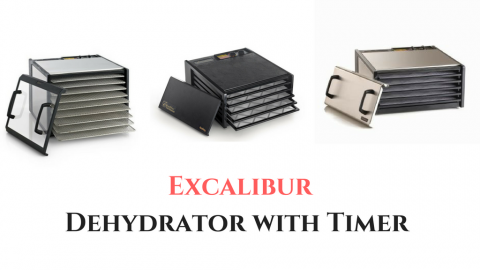 Here we will share with you the reviews of 9 best Excalibur dehydrators with timer along with some useful info. 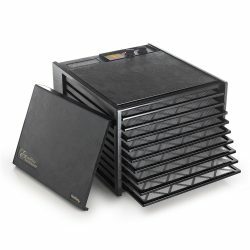 What are the Benefits of the Excalibur Dehydrator with the Timer? ​After switching ON the timer and setting the time as per your requirement, there is no need to stand nearby the machine. It will shut down as soon as the time gets up. It also means that during that time you can do any of your other work without keeping an eye on your Excalibur dehydrator with timer. The Excalibur dehydrator with timer shut down automatically when the time which you set gets over. People who buy dehydrators without a timer have to purchase an additional timer along with their machine to overcome the time issue. A timer in the Excalibur food dehydrator also gives you good control over your appliance. You can set the time according to the type of food which you are drying in it. Some food dryers also come with the instruction booklet in which you get all the detail regarding the time required for drying a particular food. It also benefits in saving your food from over-drying and under-drying as you set the exact time which requires for dehydrating a specific diet. It not only helps you in drying your food correctly but also allows maintaining the proper texture of the dried food. 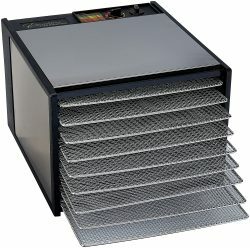 The top name on our list of Excalibur dehydrator with timer is Excalibur 3926TB Food Dehydrator. 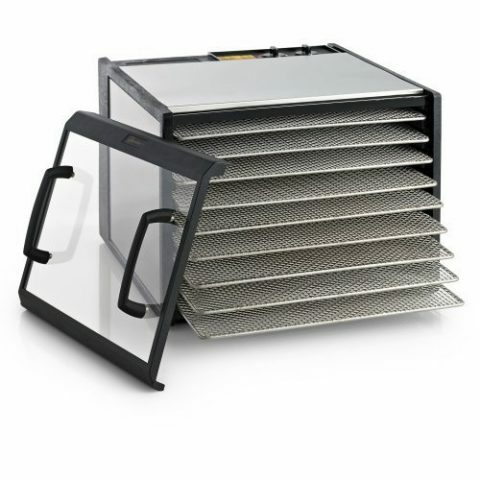 It is a nine tray food dehydrator which comes with the 15 square feet of the dehydrating space. You also get an inbuilt ON/OFF switch so that you do not have to shut down the machine directly from the socket. What we like more about this product is that along with the 26-hour timer it also comprises of the adjustable thermostat. Along with the machine, you get one flexible polyscreen tray insert which stops the foods from sticking. The wattage power of the appliance is 600 watts which are high enough for drying any food. 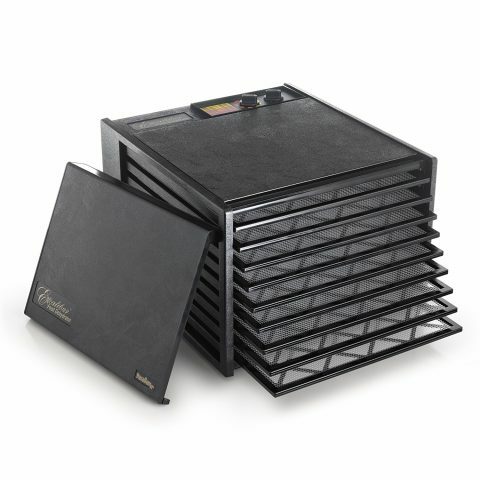 The Excalibur 3526TB is a five-tray food dehydrator which offers you drying space of 8 square feet. 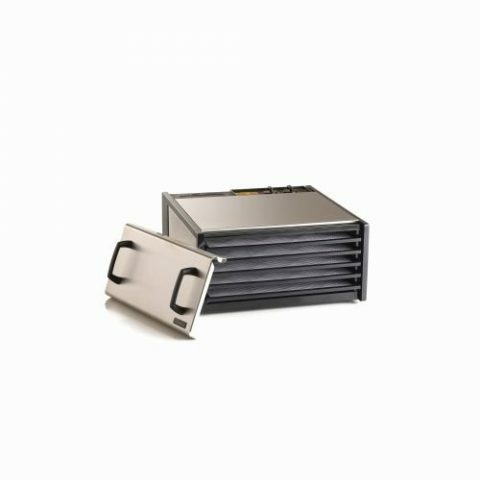 The wattage power of the machine is 440 watts, and it is perfect for drying for those families who have small gardens of fruits and vegetables in their homes. You can operate it efficiently with the help of the inbuilt ON and OFF switch. Different types of foods get quickly dry in it because of the adjustable thermostat feature. What we like more about the product is that it has 26-hour timer that allows you to leave the machine alone while drying your foods. The next Excalibur dehydrator with timer is Excalibur 3948CDB. It is a nine tray food dehydrator which gives you 15 square feet of drying space. You can dehydrate fruits, jerky, herbs, meat, and vegetables in it with the help of the two temperatures feature. It has a 48-hour timer which is quite enough in comparison to the other food dryers. The range of adjustable thermostat feature in this unit is 85 degrees Fahrenheit to 165 degrees Fahrenheit. What we like more about the product is that it has the clear door made up of polycarbonate which let you see the process of drying quickly in the machine. 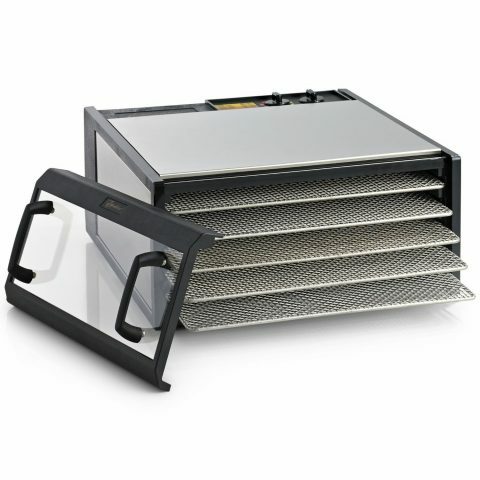 The Excalibur D500SHD is five trays stainless steel dehydrator which gives a classy touch to your kitchen. It has the features of the 5-inch fan and adjustable thermostat also. The 26-hour timer in the machine let you dry your food even if you have the busy schedule. 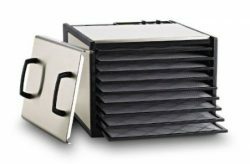 What we like more about the product is that it comes with the Excalibur’s patented Parallax Horizontal Air Flow and Hyperwave Fluctuation Technology that is perfect for drying the food with heat. This food dehydrator with timer is also a stainless steel machine with the interior made up of the BPA free plastic material. It comes with the adjustable thermostat range of 105◦F to 165◦F. The door of the machine is transparent so that you can check the ongoing process of drying anytime. The big size nine trays of the unit offers 15 sq. feet of the drying space. The best thing about the product is that you can dehydrate your food at any time of the day with the help of the 26-hour timer without keeping your eye on it. This Excalibur food dehydrator also has a 26-hour timer which you can use while drying your food without any worries in your mind. It comes with the adjustable thermostat (95 degrees F to 155 degrees F) feature which let you dehydrate a variety of foods perfectly. You get a book "Preserve it naturally" along with the machine that comprises a number of recipes in it. It has a gleaming design that makes your kitchen look elegant. The main highlight of the product is its reliable and robust stainless steel shelves. 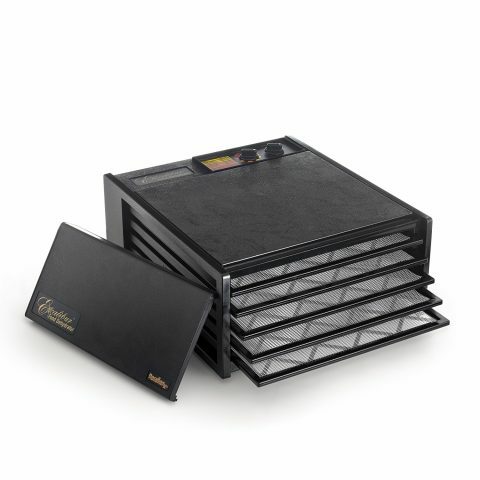 The seventh name on our list is Excalibur DS900S food dehydrator whose exterior made of the stainless steel material, and its trays are of plastic material. The big size nine trays of the unit give you 15 square feet of the drying space. It has an inbuilt 26-hour timer that helps you in drying your food without paying much attention towards it. You can adjust the temperature of the machine between 105◦F to 165◦F as per your need and requirement. The Excalibur D900SHD food dehydrator has an inbuilt 26-hour timer which you can set as per your convenience. The nine big size trays give you an ample drying space of 15 square feet. It equips with a 600 watts power and 7 inches fan. The range of the adjustable thermostat feature is between 105ºF to 165º F that helps you in drying any food quickly and efficiently. The manufacturer offers you ten years limited warranty period along with the product too. 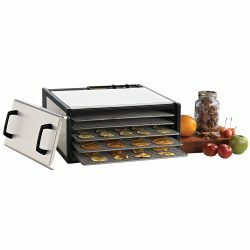 The last and final name on our list is of Excalibur D500S food dehydrator which comes with five big size plastic trays that offer 8 square feet of the drying space. The exterior of this product made of the stainless steel material. You can use its 26-hour timer for drying your food at the nighttime or in your busy schedule. Temperature range of 95 degrees F to 155 degrees F is quite enough for drying the food safely and correctly. Q: Hello, I want to buy an Excalibur food dehydrator with the timer for my home at the reasonable price. Which one should I buy? 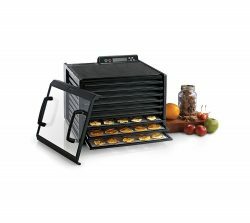 You can buy an Excalibur food dehydrator with timer. All of them are good, but they will be little costlier than the dehydrators without a timer. 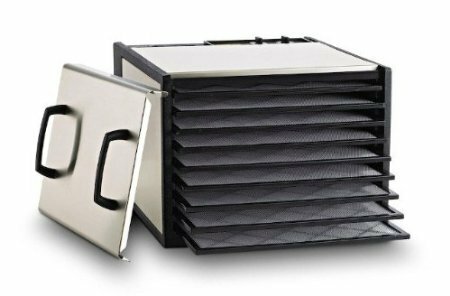 Q: After setting the timer of the dehydrator, if I go outside of my home due to some work then will it shut down on its own? Yes, the machine will shut down on its own as soon as its time gets up. It is a useful feature for the people who have the hectic schedule and didn't have much time for an entire day. Q: I have a food dehydrator at my home. But it does not have a timer in it. What should I do now? Well! In such a case, you should buy an additional timer from the market or any online shopping websites. It will work similarly like the inbuilt timer in the food dryer machine. But yes you have to bear the additional expense of buying it. Q: How will I know that which Excalibur food dehydrator with the timer should I buy for myself? There are two main things which you need to consider while buying the Excalibur dehydrator with timer. First one is your budget and second is the maximum time of the timer in the dehydrator. You have to see whether the type of food you need a less time setting the timer or more than that. Most machines come with the 26-hour timer and 48-hour timer. So, if you know your requirement well then, it will be easy for you to choose between buying. Q: I have heard that the Excalibur dehydrator with timer consumes more electricity than the dehydrators without a timer. Is it true? No, this is not true at all. The timer does not affect the power consumption of the food dehydrator. The timer will add up to the cost of the product and not your monthly electricity bill. So, you can buy them without any worries in your mind. Q: Does the timer always come in the expensive Excalibur food dryer? No, it is not right. It can come in the reasonably priced food dryers also. In the end, we just want to say that drying food in the Excalibur dehydrator with timer is much more convenient and comfortable than drying food in the dehydrators without a timer. So, you have to decide that which dehydrator suits your need like time required for drying and also your budget. We have reviewed all the above products on the list quite thoroughly with in-depth research. So, whatever product you pick for your home will surely going to serve you for the longest time. If you have any question regarding the above article then, do write to us in the below comment box. We will reply back to you at the earliest. You can also share it with all your near and dear ones who are in search of the Excalibur dehydrator with timer.